Notice is hereby given that the Borough of Middletown, Dauphin County, Pennsylvania is seeking proposals from qualified professional vendors for Actuarial Consulting Services including, but not limited to, actuarial and administrative support. 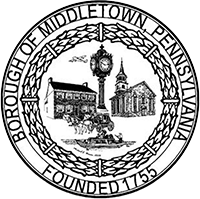 Written proposals, in accordance with the specifications and procedures identified in this Request for Proposals (“RFP”) will be received at the following address: The Borough of Middletown, 60 West Emaus Street, Middletown, PA 17057. Proposals must be received no later than April 19, 2017 by 12:00 p.m.
Proposals are sought for actuarial consulting services for the Non-Uniform Defined Benefit Plan. In addition, the Borough has authorized a Defined Contribution Plan, which is a Money Purchase Pension Plan and will consider proposals that include the provision of services to the Money Purchase Pension Plan. The Defined Benefit (non-uniform) and Defined Contribution Plan services are considered individual components of the services being sought under this RFP. Firms may submit Proposals relating to all of the services outlined in this RFP, or a part thereof. Firms submitting Proposals shall demonstrate knowledge of, experience and expertise in performing the services detailed in the RFP on which they are submitting Proposals. Applicants shall complete Proposals in accordance with the RFP available at the Borough’s website (middletownborough.com). Proposals shall be submitted to the Borough by April 19, 2017. After verification by the Borough that the Proposals are complete, the Borough will evaluate the qualifications and experience of each firm submitting a Proposal, and the Borough will select the most qualified Firm or Firms; this RFP may result in an award to more than one vendor based on the determination of the best interests of the Borough.